There’s a sort of myth that “cheaper is better” with commercial flooring. Nothing could be further from the truth, or more certain to lead to extra cost for commercial building managers. The fact is that high quality flooring needs less maintenance, and lasts much longer. The best flooring solutions for commercial premises are the new generation carpets, and there are added benefits as well. · Cost: Commercial interiors aren’t cheap, and outlay on a large area like flooring is a natural issue. · Maintenance: Repairs and replacement of many types of conventional flooring can be disruptive and expensive. Low grade flooring of any kind is notorious for being easy to damage and costly to fix. · Safety: Some surfaces are better than others for safety. Wood, concrete and tiles are hard surfaces, and a slip or fall can be expensive for building owners. The long term view is usually the best with any kind of major business outlay, and flooring is no exception. With flooring, the idea is to contain cost and benefit from long product life to deal with these issues. In the past, old style carpets were a debatable option, because the high quality broadloom carpets were not only very expensive, they were prone to serious wear and tear over time. Repairs and replacement were also costly. It was the limitations of the old carpets that spawned the new generation of ultra-heavy duty carpeting. If you’ve seen those extremely tough-looking carpets at airports and other high traffic areas in public buildings, they’re very good examples of the new ideas. The new carpets are actually carpet tiles, although they don’t look like tiles. An innovative US carpet manufacturer got the message about the failings of the old style commercial flooring, and the whole idea of commercial carpet would never be the same again. The idea was to create very high quality carpet tiles, with their own underlay and glued, not stitched, together, to provide a seamless single surface. With this fundamental rethink came new technology which allowed for sustainable production, driving costs down. New software also created a brand new way of customizing carpets, giving customers a way of viewing their carpet design choices in different environments and colour mixes. · Tiles rarely require maintenance and can be replaced very quickly, with minimum disruption and cost. · The new fabrics are extremely durable, and provide good surfaces for customer safety. · There’s basically no limit to the customization possibilities. The new carpets can be tailor made for any type of commercial premises. The new carpets have revolutionized commercial interior design. They’ve also become the industry standard best practice solution for commercial building managers trying to achieve that difficult mix of best quality design and best quality materials. The other commercial angle to the new carpets is one that all business people will appreciate: They’re much better business propositions for their customers. The market has spoken, and these are the floorings of the future. Installing carpet is one of the best ways to add style and elegance into your home. 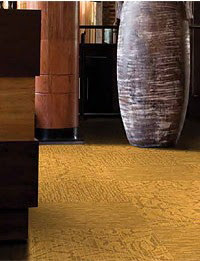 The type of carpet you choose can greatly impact the appeal and feel of any room. That is why having basic understanding of the various types of carpet can help you find the most ideal carpet in terms of style and maintenance.